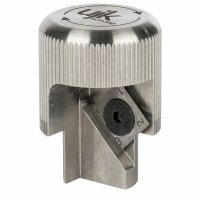 This specially designed tool cuts a neat, small chamfer around the precise 20 mm dog hole made by the UJK Technology 20 mm cutter, as part of using the Parf Guide System. You can also use it on the Festool MFT/3 table. A shallow chamfer has two benefits. Its primary advantage is it allows full use of the UJK Technology Parf Super Dog, when fitted with its stop collar. Secondly, by removing the sharp edge around the hole, it prevents damage from repeated insertion of dogs, clamps and other accessories. If the edge becomes dull, turn the cutter 90° to a fresh edge; in all probability it will never need replacing. Only suitable for use with MDF or ply with a melamine facing. The ujk technology brand was launched by Axminster in 2012 to offer a range of carefully selected products. The range includes routing, measuring and wood jointing products.